The Special Premier League Competition, otherwise known as Tier 1 League of the Special Normalisation Cup gathered momentum over the weekend with fascinating results in both zones of the league. Without doubt, the highlights of the weekend was Asante Kotoko’s emphatic victory in Nkoranza, and Karela’s defeat of Hearts Oak in Anyinase. The Porcupine Warriors, after suffering a blip on midweek in Tarkwa, returned to winning ways, this time thrashing Techiman Eleven Wonders in Nkoranza, the adopted home of the Techiman-based club. Abdul Fatawu Seidu grabbed a first half brace, while Evans Owusu scored the third in the second half to hand Kotoko a win, which elevated them to top spot of the Northern Zone of the league. In Dormaa Ahenkro, Ashantigold fought hard to hold Aduana Stars to a goalless draw. Ashantigold are second on the table, just a point behind Kotoko ahead of their mouthwatering clash on match day four of the league. In the other match of the Northern Zone, Berekum were stunned at home by Bechem United, who handed them a narrow 1:0 defeat. Kofi Agbesimah was the hero for the visitors, as he converted a 74th minute penalty. The win moves Bechem United up to 3rd on the table. In the Southern Zone, Karela continued their unbeaten run in the competition with a 1:0 victory courtesy Solomon Sarfo Taylor’s lone strike. 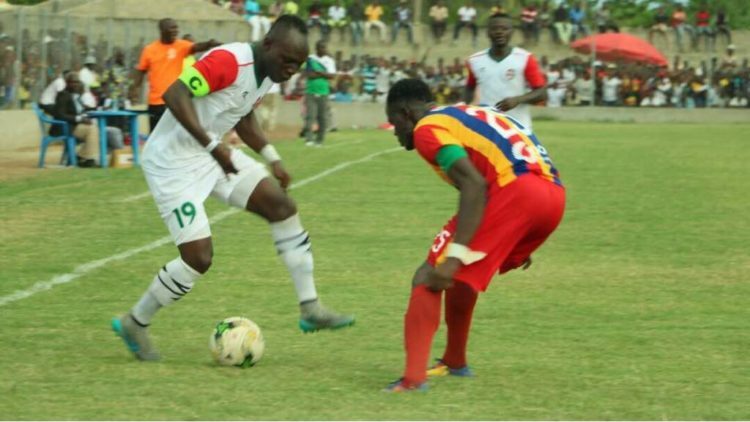 The win consolidated Karela’s position on top of the league, while it handed the Phobians their second successive defeat of the competition to leave them four points behind the leaders. In Dansoman, Liberty Professionals defeated Inter Allies 2:1 to move up to second on the table. Elvis Kyei Baffuor opened the scoring for Liberty and Effiong Nsungusi equalized for Inter Allies. But Simon Zibo scored the winner for Liberty Professionals. WAFA dropped down to third on the table after drawing 0:0 at Elmina with Sharks. And at Fawu, Razak Cromwell’s penalty ensured Dreams FC defeated Ebusua Dwarfs 1:0 to hand Dwarfs their third successive defeat in the competition in as many games. Dwarfs are rock-bottom on the table.